You don't get into the White House by accident. It is not airport security, where if you get the fat guy thinking about lunch, your hunting knife and your eight ounces of shampoo sail on through the x-ray. It is nothing like that. The only way anybody, and I mean anybody, gets into the White House, let alone a state dinner, is because someone on the inside purposely let him in. I knew news organizations in American were dying, I didn't know I had missed the funeral. On Fox News Sunday, Indiana Democrat Evan Bayh said, "Like [shoe bomber] Richard Reid, these folks may change the way people go to the White House," and said this breach of security would lead to stricter safety measures at 1600 Pennsylvania Avenue. Perhaps he's never gone in as a guest. They couldn't be any stricter. 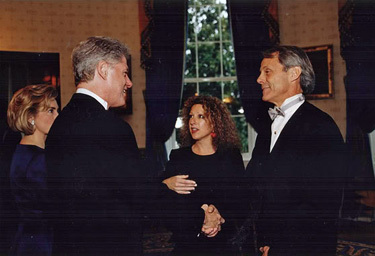 In 1993 I was the comedian performing at President Clinton's first White House Press Correspondent's dinner. Weeks earlier, I was asked to provide my legal name, address, social security number, date of birth, and on and on. Thank God, unlike when doing Letterman and Leno, I didn't have to provide the jokes in advance for approval. At least the White House understands the spontaneity needed for good comedy. No doubt my entire family history was checked out, and I was cleared. I went to a private reception with the president, vice president, their wives, and a few others. I had dinner. I performed. A good time was had by all. No matter. Two years later I was to entertain the president and congress again, this time at Ford's Theater, for an ABC TV special. There was a reception at the White House first. Again, despite having been cleared by the network and okayed by the White House and thoroughly vetted earlier, I filled out all forms in advance. When I showed up with my husband at the White House clearing gate, we were kept there for half an hour while they matched us to our documents, then ran checks. Literally, a half hour outside in the cold. They kept apologizing, but explained this was the way it worked. They made copies of our I.D. My husband had to remove his jacket, and we were frisked: and I mean frisked. I almost bought a pregnancy test on the way home. At every step of the way our passes were checked and rechecked with intense scrutiny. To approach the president and Mrs. Clinton, we were rechecked on the receiving line. Photos were taken. At every step of the way, there were more men with earpieces standing poised than in even the most overblown Bruckheimer movie. Always checking our passes, our demeanor, us. You don't "breeze on past" White House security by simply "walking in with confidence." It's not a hotspot in the Meatpacking District. The guards are not intimidated, they are of a military mentality, and while they kept us there, we talked about show business. They knew who I was and that I wasn't a danger, and still ran the abc's because that is the protocol. Something is wrong here. Instead of the press speculating over whether the two gate crashers are asking to be paid for their TV interviews, they should be asking how this couple is allowed to be free at this moment. Instead of bloggers angrily speculating that if this couple was black, they would not have gotten past security, they should be chillingly stunned that anybody not cleared got through security. These kinds of breaches don't just "happen." Somebody in this government is putting this president's life at risk. Reality show? Time to bring back The Mole. And if it really, really, really did "just happen"? Well, a lot of intelligent, hard working people are looking for jobs right now. I suggest replacing the president's detail with people who weren't rejected by the TSA. Or Wal-Mart.